Sorry for the late weekly update but we have been very busy with guests over the last few days. Last week was a better week for our anglers with a total of 10 fish landed as we reached over the 100 mark for the season. It was also a week of first fish for two anglers. As previously reported on facebook , Dave Carney’s party were on Dalreoch for the week. Monday and Tuesday proved to be frustrating apart from Dave’s 16lb fish late in the day from the Craig pool on Tuesday caught on a sunray off the surface. On Wednesday we were washed off with a 7ft flood. I had hoped that this would freshen things up a bit and luckily it proved to be the case. On Thursday we landed a total of 5 fish to 14lbs. Jim Hopkins took the afternoon on Almont and had 2 fish at 12 and 14lbs, both from the Hut pool. 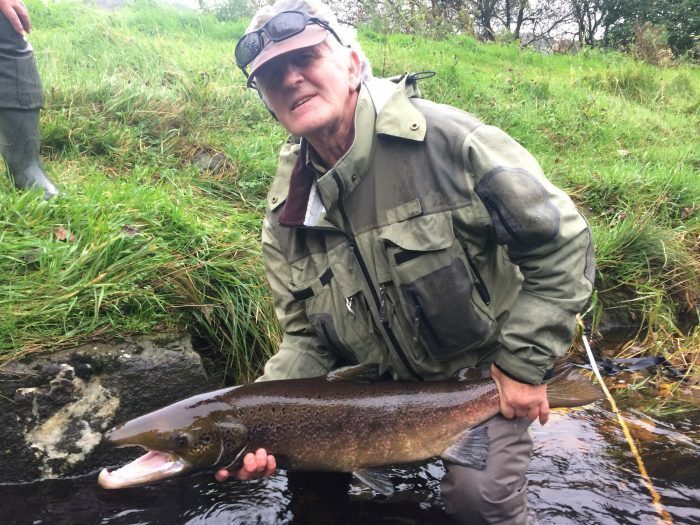 On Dalreoch everyone was delighted as Geoff Holywell landed his first ever salmon from the Craig, well done that man, hooked for life. Dave Carney also had a 4lb fish from Greystanes. As the day drew to an end we saw a fish come into the tail of the Craig and Brian Jones was in the right place as his line tightened, after a good battle i netted a 13lber for him. 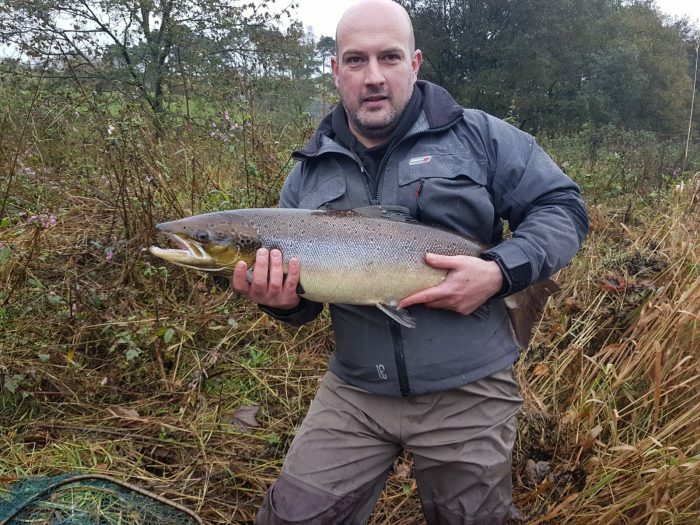 Friday proved to be quiet again apart from a fish lost at the bank for Dave Carney and another lost for Graham Hooper on his afternoon up on Almont. On Saturday we had a better day with four fish landed. The current top rod Steven Cope had another good morning on Almont. Steven had brought along his friend Tam Hay with him for the morning, Tam had never fished for Salmon so shared a rod with Steven to give it a try. Steven lost a fish early on but then had a 9lber from the Lairds Run. This was quickly followed by another hook up and Steven gave the rod to Tam who played and landed his first salmon which came in around the 18lb mark. Well done that man. Another angler hooked on Salmon fishing. Andy Blyth also had an 8lb fish again from Lairds Run as well as losing another two. 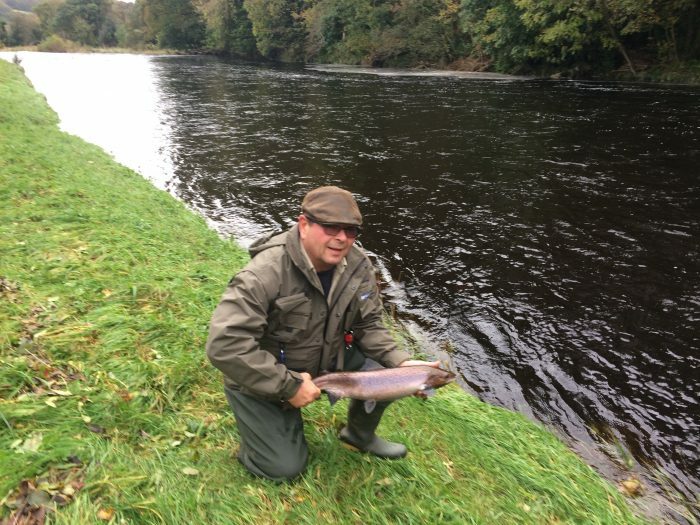 Late in the afternoon another cracker was landed from Hairs Took on Dalreoch by Alan Box. 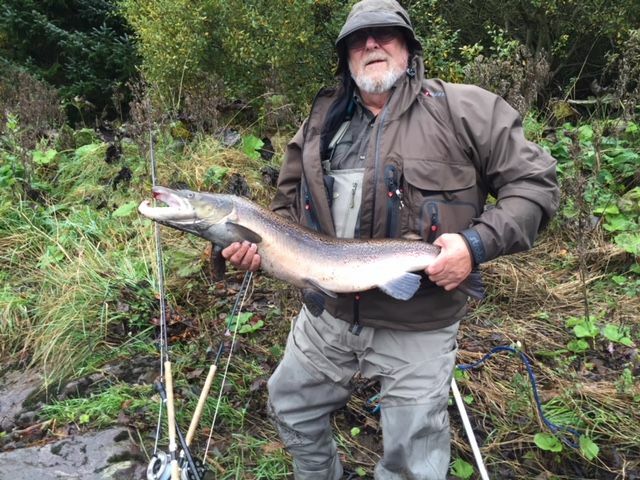 Alan seems to be a man of big fish from the Stinchar as his last fish was over 20lbs. By the end of the week we were up to 103 fish for the season.